Why Not Just Go Online and Create Your Own Estate Planning Documents Cheaply? There are many software programs, as well as websites, that sell do-it-yourself estate planning documents. These websites and form creation tools seem to offer a convenient and cost-effective alternative to consulting with an estate planning attorney. But will they really meet your needs and protect your family? Is online, do-it-yourself estate planning worth the perceived upfront savings? In all but the simplest scenarios, do-it-yourself estate planning is risky at best and can become a costly substitute for comprehensive in-person planning with a professional legal advisor. Typically, these online programs and services have significant limitations when it comes to gathering the information needed to properly craft an estate plan. This can result in crucial defects that, sadly, won’t become apparent until the situation becomes a legal and financial mess for your loved ones. Your family situation, goals, and assets are unique. Plus, incapacity issues deserve more than the perfunctory attention offered by template documents. There are nuances which simply can’t be adequately addressed in an off-the-shelf document. In addition, non-traditional families, or those with a complicated family arrangement, require more thorough estate planning. The options available in a do-it-yourself system may not provide the solutions that are necessary. 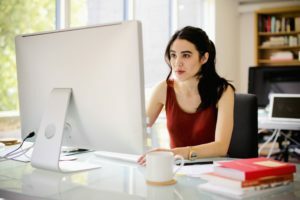 A computer program or website cannot replicate the intricate knowledge a qualified local estate planning attorney will have and use to apply to your particular circumstances. If you’re a person of significant wealth, then concerns about income and estate taxes enter the picture too. An online estate planning website or program that prepares basic wills without taking into account the size of the estate can result in hundreds of thousands of dollars in increased (and usually completely avoidable) tax liability. A qualified estate planning attorney will know how to structure your legal affairs to properly manage – or, in many cases, even avoid – the burden of the death tax as well as minimize the impact of ongoing income taxes. One important aspect of estate planning is protecting adult children from the negative financial consequences of divorce, bankruptcy, lawsuits, or illness. An online planning tool will not take these additional steps into account when putting together what is usually a basic estate plan. Similarly, parents who have children or adult loved ones with special needs must take extra caution when planning. There are complicated rules regarding government benefits that must be considered, so these valuable benefits are not lost due to an inheritance. No matter how good a do-it-yourself estate planning document may seem, it is no substitute for personalized advice. Estate planning is more than just document production. In many cases, the right legal solution to your situation will not be adequately addressed by these do-it-yourself products – affecting not just you, but generations to come.